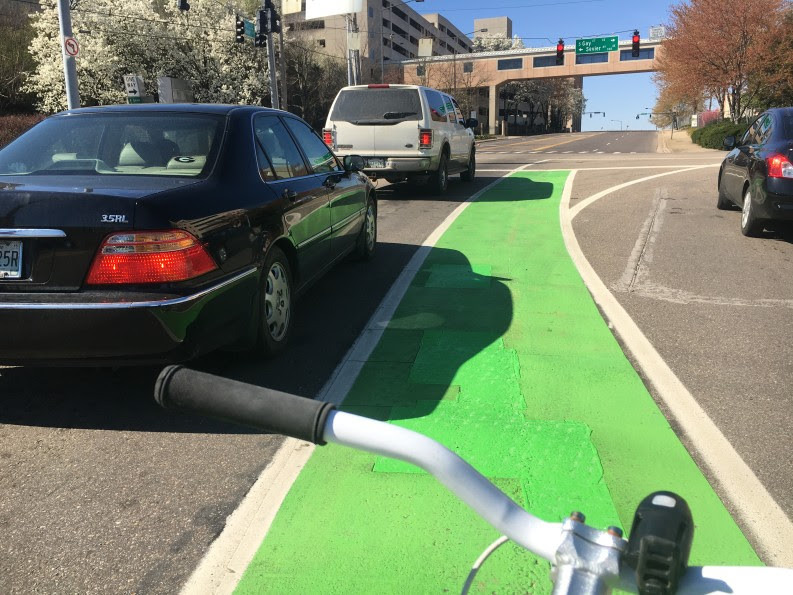 A green lane for bicyclists in Knoxville, TN. Photo via the Knoxville Mercury. Building a connected network of streets that is safe for everyone, no matter how they travel, takes region-wide collaboration. Our newest technical assistance award is designed to help three agencies in Tennessee do just that. Smart Growth America and our program the National Complete Streets Coalition are proud to announce that a partnership of agencies in Chattanooga, Knoxville, and Nashville, TN is the winner of our first-ever Complete Streets Consortium technical assistance. The Chattanooga TPO, Knoxville Regional TPO, and Nashville Area MPO applied for and won the award collaboratively, and will together receive a set of three free technical assistance workshops. Each of the winning agencies will host one workshop over the next six months which will be tailored to each region's specific opportunities and challenges. The series of workshops will provide participants with tools and strategies to implement Complete Streets that advance economic, health, and community vibrancy goals. Discussions will focus on how to create a safe and inviting transportation network for everyone in the community, including bicyclists, drivers, transit operators and users, and pedestrians of all ages and abilities. Each of the three participants will create a Complete Streets implementation plan as part of the workshop. Congratulations to the winning agencies. We are looking forward to working with you on this exciting project. This technical assistance is funded through a grant to Smart Growth America from the U.S. Environmental Protection Agency's Office of Sustainable Communities under their Building Blocks for Sustainable Communities program; the Centers for Disease Control and Prevention have partnered with EPA through this grant to support the Complete Streets Consortium Workshop series. EPA’s Building Blocks program funds quick, targeted assistance to communities that face common development problems. Through the program, Smart Growth America has already provided free assistance to more than 70 communities across the United States from Hawaii to Maine.